I love playing and crafting with toddlers! Sometimes I actually need to get something done though (like right now we are getting ready for a big remodel and are moving lots of things), so I also love having toys at my house that my kids will play with either independently or semi-independently. Lately there are four types of toys that stand out as all-time favorites with my toddler. I thought I'd share them with you... and then maybe you can share your favorite toys for your toddler and I can add them to my list too? Toddler interests and needs are constantly changing, so it is nice to discover new ideas! 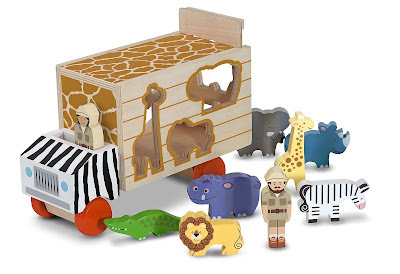 We have several shape sorters, but my daughter is currently in love with her Melissa & Doug Animal Rescue Shape-Sorting Truck . I love that the pieces are chunky and easy for a toddler to manipulate. She also thinks it is fun to open and close the back of the truck and drive it around. My 5 year old likes to play with it too... so that kinda makes it extra awesome. I don't know about you, but I think it is fun to put shapes in shape sorters again and again and again. These toys definitely get played with multiple times a day and are excellent for introducing language concepts (in, under, inside, over, through, around, etc.) and new vocabulary words. If I have a project to do that my toddler can't help me with, I can usually grab a few chunky wooden puzzles and she'll sit next to me and we'll both do our "work" together. We mostly only have Melissa & Doug Puzzles at our house. They are on a low and easily accessible shelf in each child's closet and they are played with often. They also follow me around the house so I am constantly looking for their pieces! 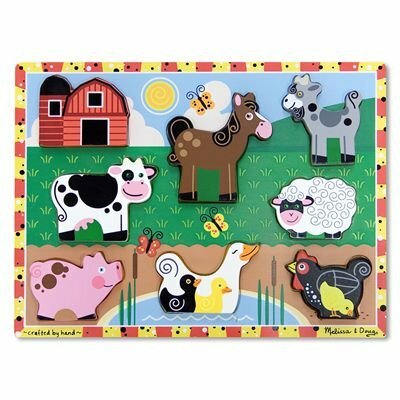 This Melissa & Doug Farm Wooden Chunky Puzzle is probably the most loved puzzle. It is super easy for my toddler, so she thinks it is a lot of fun. 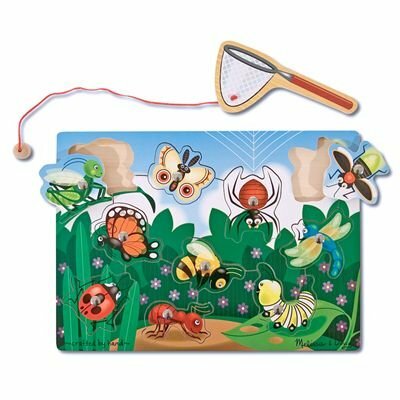 She also recently got the 10-Piece Magnetic Bug Catching Game (puzzle). It is a little bit harder for her, so she needs me close by to help out a bit, but she loves the colors and talking about the insects and trying to do it "all by herself!" As far as toys that aide with imaginative and creative play, I am a big fan of Fisher Price Little People. I don't love having loads of plastic toys, but I really like these ones. 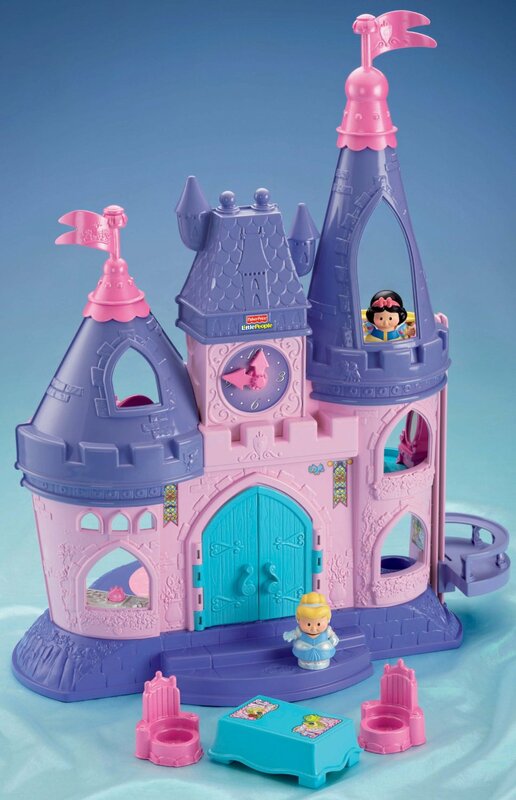 We have a lot of different sets that we rotate around the house, but my daughter's absolute favorite is the Fisher-Price Little People Disney Princess Songs Palace. I was honestly not that excited about it when it arrived at Christmas. I was not ready to enter into the world of princesses yet. That being said, she plays with it ALL the time. The music actually doesn't bother me, the elevator and accessories are cute, and the little turnstyle that helps the princesses dance around is entertaining because she spends all of her time trying to figure out how to get them to fly off faster and faster. I've also noticed her making the princesses talk to one another and work together to do things. One of the main reasons she plays so well with her Little People is because I play alongside her a lot and model how to have the characters interact and how to have fun playing by myself. She also spends a lot of time with her Fisher-Price Little People Animal Sounds Farm . It is so exciting to put all of the animals to sleep in their different spots and then make animal noises herself! My kids are huge fans of things that move! My daughter is probably even more obsessed with trains, trucks, and cars than my son was. 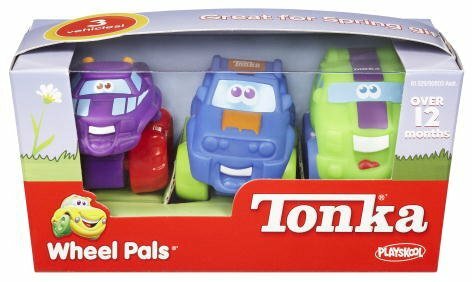 We have a lot of different types of cars, trains, and trucks, but the current favorite ones are the large Playskool Tonka Wheel Pals. They are easy to grab on to and carry around... so my daughter likes to bring them all over the house with her. They are also friendly with their smiles and cute eyes, so she likes talking to them too. In addition to toys we've purchased, other favorite toys include chairs, pillows, rocks, random balls, and kitchen utensils. Often I wonder why we even have toys because my kids find the oddest things to play with! I love how they use their creativity though! Now that I've shared my toddler's current favorite toys, what are your toddler's favorite toys? Does your toddler play independently? My daughter plays independently, although sometimes not as much as I would like (so I can get dinner done...) Her favorite unconventional toys right now are an aerobic step and a plywood board that she uses to make a ramp. She then sends balls, dolls, stuffed animals and herself up and down the ramp for hours! My kids have gone BANANAS over this big cardboard box. Here's a link to my post about 10 Ways to Rock Out a Cardboard Box. We STILL haven't been able to get rid of this thing. The kids LOVE it! and, a cardboard box is always a favorite too! Little People is a huge favorite with my two year old daughter too. We have the princess castle and also the farm animals with the barn, but by far her favorite is the Zoo Talkers Animal Sounds. She can play with this for a long time, and the animals are some of her favorite things to carry around as well. We are definitely Little People fans at our house! 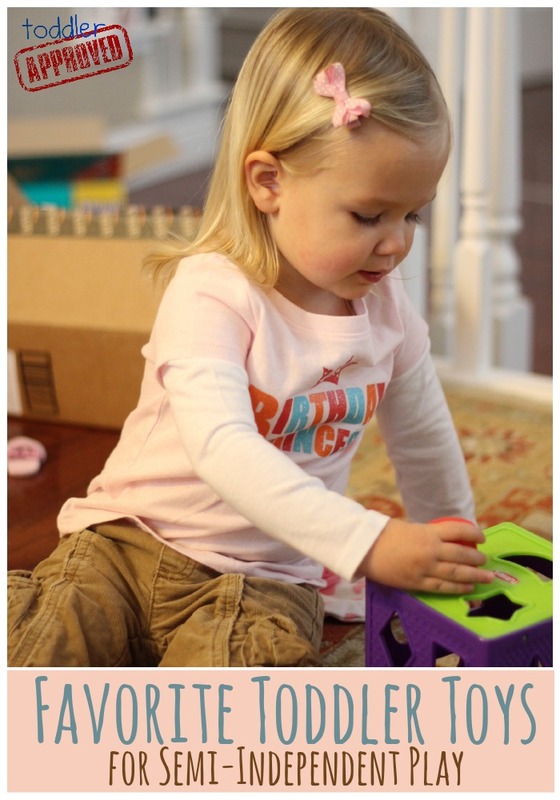 I love chunky puzzles and shape sorters as toys for kids! My kids loved them when they were small and I always felt good about buying them. They also loved stacking cups. We have that insect puzzle and those cars. Both are favorites. Lego duplos are the toy I'd add to the list. You can do so much with them! Great ideas for independent play. A ribbon wand is my daughter's current toy of choice. She pretends it is many different things and will play with it for a long time. Great entry - Lego Duplo is a favourite here for Elizabeth, age 2. She is always wanting to build a farm, or even just to line up the animals... although last week she had made a 'swimming pool' and the animals were all going swimming. You just can't predict where their independent play will take them! If you can get your hands on the original (1960's and 1970's) Fisher Price playsets, those are the best! We have many of our toys that our toddler adores. Yes they have little people in them, yes they are small. We know our kid, and she has stopped putting things in her mouth. She will play semi-independently with these for awhile. Also, IKEA has some great toys including lots of play food and kitchen stuff that our 17-month-old loves to play with. Our toddler grandchild spent a lot of time the other day with an inexpensive set of 1-3" paint brushes and an empty pail, 'painting' or 'cleaning' every surface that was reachable. A huge favorite sorter/stacker/nesting blocks set is the Topanimo by Djeco. It is six nesting/stacking boxes and six small animals. The boxes are designed with an opening, bright colors, numbers, colors, shapes, and a continuous vine design for all kinds of possibilities. One of the few great 'in-between' ages toys, appropriate for 18m+. Available on Amazon and better toy stores. My 2 year old loves the Measure Up collection and Memory Moves from Discovery Toys!